All India, 22nd January 2019: The Department of Culture and Tourism – Abu Dhabi (DCT Abu Dhabi) has concluded its successful participation at the SATTE Conference in India, the seventh time that Abu Dhabi has led a delegation to take part in this renowned travel and tourism platform. The DCT Abu Dhabi delegation for the 26th edition of South Asia’s leading travel show, which took place in New Delhi from 16th – 18th January, included 11 stakeholders, tour operators, and government entities working across inbound, outbound, and domestic travel including Etihad Airways, Yas Experience Hub, Sofitel, Rotana, Sheraton Abu Dhabi Hotel & Resort, Jumeirah, Radisson Blu, LAMA Tours, Royal Arabian Louvre Abu Dhabi and Abu Dhabi Convention Bureau. The forum enabled Abu Dhabi to cement its status as a destination of distinction for Indian tourists by showcasing the Emirate’s top attractions. Around 500 business meetings took place involving the Abu Dhabi delegation during the conference, which aimed to generate new and repeat business between India and the emirate. The delegation showcased the Emirate’s position as one of the world’s most sought-after travel destinations which features plenty of exciting attractions, including the newly opened Warner Bros. World Abu Dhabi, Louvre Abu Dhabi and Sheikh Zayed Grand Mosque. In addition, the delegation promoted some the finest hotels in the world such as Qasr Al Sarab, Emirates Palace, Fairmont Bab Al Bahr, Yas Hotel Abu Dhabi and establishments in the Rotana group. 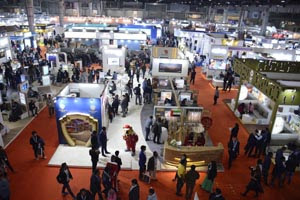 With world-leading destination representation, technology and private sector companies all under one roof, the exhibition offered significant exposure to established players in the travel and tourism industry, as well as providing newcomers with a wide range of business opportunities. 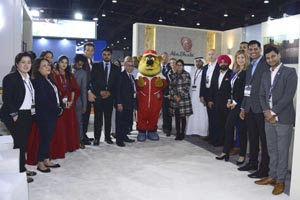 The delegation leveraged the event to further build on Abu Dhabi’s efforts to invest in leading platforms aimed at boosting inbound visitors to the Emirate from India. The Abu Dhabi Pavilion hosted leading entities from the government and private sectors and also witnessed a series of performances which included appearances from mascots from Ferrari World Abu Dhabi and Warner Bros. World Abu Dhabi as well as an Arabic calligrapher, which helped event visitors and consumers get a first-hand experience of Abu Dhabi’s many cultural attractions. The Department of Culture and Tourism conserves and promotes the heritage and culture of Abu Dhabi emirate and leverages them in the development of a world-class, sustainable destination of distinction, which enriches the lives of visitors and residents alike. The organization manages the emirate’s tourism sector and markets the destination internationally through a wide range of activities aimed at attracting visitors and investment. Its policies, plans and programs relate to the preservation of heritage and culture, including protecting archaeological and historical sites and to developing museums, including Zayed National Museum, Guggenheim Abu Dhabi, and the Louvre Abu Dhabi. DCT – Abu Dhabi supports intellectual and artistic activities and cultural events to nurture a rich cultural environment and honor the emirate’s heritage. A key role is to create synergy in the destination’s development through close co-ordination with its wide-ranging stakeholder base.